Drive more targeted leads to your business with our suite of fully customised solutions. Through our combination of actively managed paid search, content-powered search engine optimisation tactics, and a mobile-first, locally focused approach, we generate more traffic for your brand and deliver you better leads. The most certified staff in the industry, ready to procure higher quality leads at a lower cost to you. 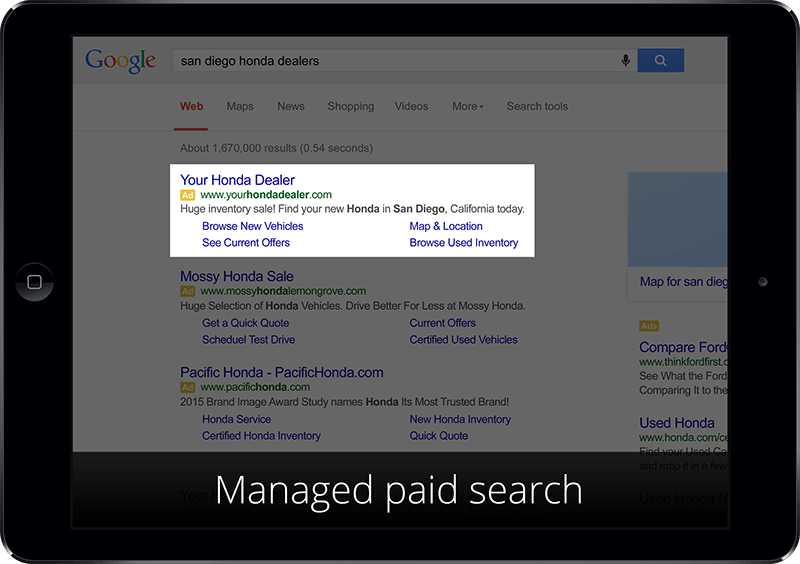 Successful paid search isn’t just popular; it’s also relevant. With the most Google-certified staff in the industry and the highest call volume per dealer of any provider, Search Optics make your investment worthwhile by leveraging state-of-the-art enterprise tools to quickly create, deploy, and edit ads that deliver real value to your brand. Instead of counting empty clicks, we measure results based on ROI – including cost-per-lead – and use the latest technology and bidding algorithms to drive those metrics. Most certified staff – We have the most Google-certified staff in the industry actively managing and optimising your campaigns. Highest call volume – We have the highest phone call volume per dealer of any digital marketing services provider. Campaign-level call tracking – Receive actionable intelligence on each paid search campaign report, available 24/7. Enterprise technology – Search Optics uses enterprise tools to manage dealer campaigns and pay the lowest bid prices. Customised ads – Our team of experts write customised ads that meet the highest quality standards in the industry. Global search engine focus – In addition to optimising your campaigns for Google, we distribute ads to Yahoo and Bing. Content may be king, but we’ll help you claim the throne and rule the search engine results pages. Better content means better results, and nowhere is this more evident than in organic search rankings. At Search Optics, we know that great SEO is all about great content, which is why we focus an immense amount of effort on creating customised, quality content that is relevant to your customers. In addition, we connect every action with actual performance — so you know exactly which tactics produce results. You’ll show up earlier and more often with great content that generates recurring value for your brand. Keywords strategy – Our staff of certified professionals research the right keywords to target and match with landing pages. Off-site content – We create dealer-specific content that addresses optimised keywords, which lives off-site and points back to you. On-site content – We build content that supports your keyword goals, including targeted landing pages each month. Sales matching – No other provider offers our ability to match your SEO leads to actual car registrations. Competitor tracking – We benchmark your performance against key competitors on Share of Voice, Ranking, and Local Ranking. Monthly in-depth strategy call – Our subject matter experts meet with you every month to evaluate your SEO performance. Non-Search Optics website optimisations – We work with all major providers to optimise your website for you. On-page optimisations – Search Optics audits your site monthly to identify and solve problems that will improve your SEO. Point customers in the right direction — yours. With 85% of your customers using local search before they even begin shopping, it is critical to monitor the growing number of online directories for outdated and false information. Using a mix of technology and manual processes, our team of professionals continually claim, audit, and update over fifty listings with updated and relevant content. Search Optics ensures your business will get noticed, reviewed, and located, thus generating you twenty percent more leads and phone calls on average. Prominent local directories covered – We cover well over half of the local search world with listings including Google+, Yelp, and Yahoo. Proven experience in delivering high-performing Google AdWords™ campaigns. Search Optics is proud to be a Google AdWords Premier SME Partner (PSP), one of a handpicked group of strategic partners that meet Google’s most stringent eligibility and training requirements, including proven expertise and years of experience in delivering high-performing AdWords campaigns for small- and medium-sized businesses. We provide end-to-end customer service, guidance, and support to take the guesswork out of campaign development so you can focus on running your business. Google and AdWords are trademarks of Google Inc. and are registered in the US. Looking for a targeted source of leads for your business? We make it easy with our customised solutions.